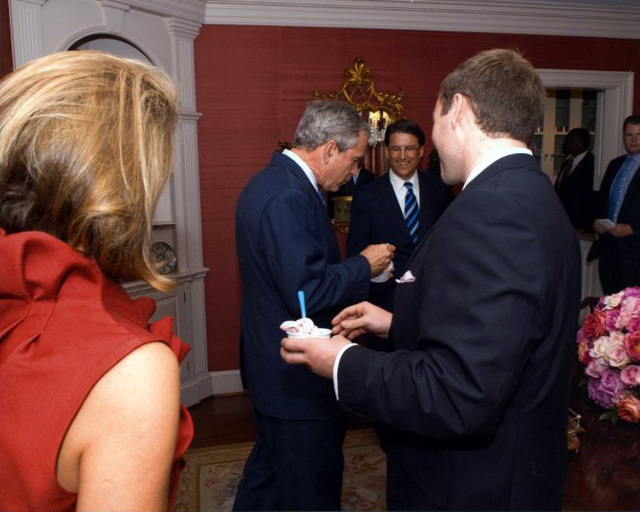 President Bush was seen enjoying a Yogen Früz strawberry banana non-fat frozen yogurt with John Kane, Yogen Früz Master Franchisee for Virginia, Maryland and Washington DC. President Bush spoke at a fundraiser for Pat McCrory, who is running for Governor of North Carolina. Yogen Früz was enjoyed by all the guests in attendance. Yogen Früz will be coming to Virginia, Maryland and Washington DC very soon. In the meantime, it is available in Chicago, San Francisco and in over 20 countries around the world. Wow, the president is really eating frozen yogurt, you know the world is becoming a healthier place to live in.